In Mimi’s house, steak is worth its weight in gold along with horse racing and chocolate. The thing is her whole family loves their steak super rare, or blue as the French say. So much so, that her mum doesn’t even really know how to cook a steak well-done! But don’t worry, however you like your steak cooked, this recipe will taste sensational. Pre-heat your oven to 200 degrees. Mix your soy sauce and balsamic vinegar together in a bowl. Add your steaks to the bowl and make sure they have a good covering of the marinade. Cover and leave until it’s time to cook them. Tip: If you have longer to marinate the steaks that is even better but don’t worry if not! Cut your potatoes into wedge shaped pieces roughly the width of your index finger. Pull the rosemary leaves off their stalks and chop them finely. 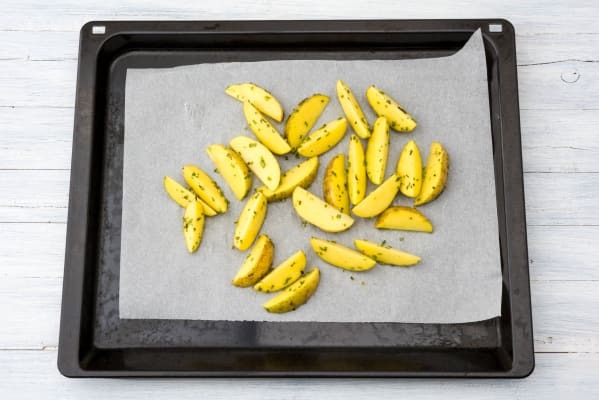 Put your potatoes on a baking tray with 1 tbsp of olive oil, 1/4 tsp of salt, a good grind of pepper and your finely chopped rosemary. Give the tray a good toss to make sure the potatoes have a good coating of oil and pop your tray in the oven on the top shelf for 30 mins, until the potatoes are brown and crispy. Cut your onion in half through the root, peel and slice it thinly into half moon shapes. 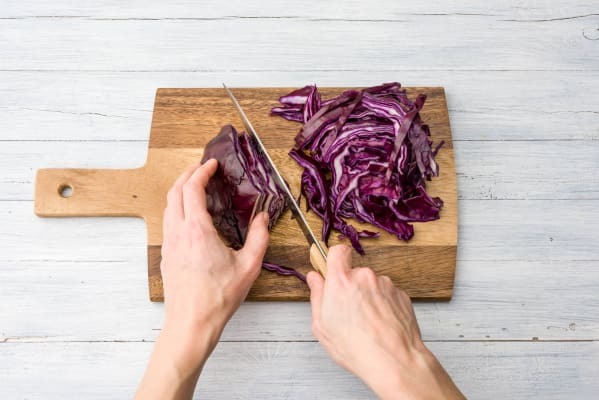 Cut out the tough rooty bit of your cabbage and slice a third of it into roughly ½cm slices. Add 1 tbsp of oil to a saucepan and put it on a medium heat. Add your onion and cook for 5 mins until soft. 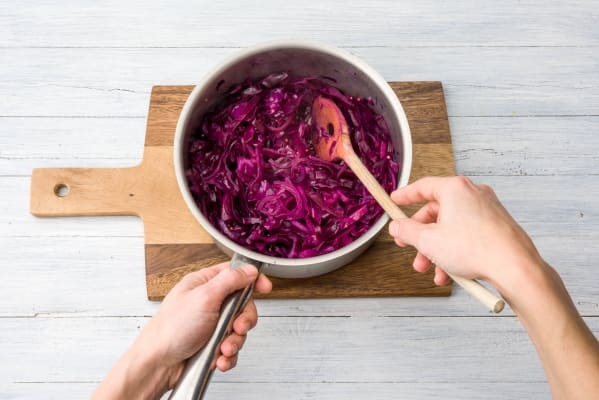 Pop your mustard seeds in the pan and when they start to pop (after about 20 seconds or so), add your red cabbage and cook for a further 5 mins. When the red cabbage has softened, add your white wine vinegar, sugar, 1/4 tsp of salt and a good grind of pepper. Stir everything together, put a lid on the pan and cook for 5 mins on a low heat. After the 5 mins are up, take the lid of the pan and cook uncovered for an additional 5 mins. 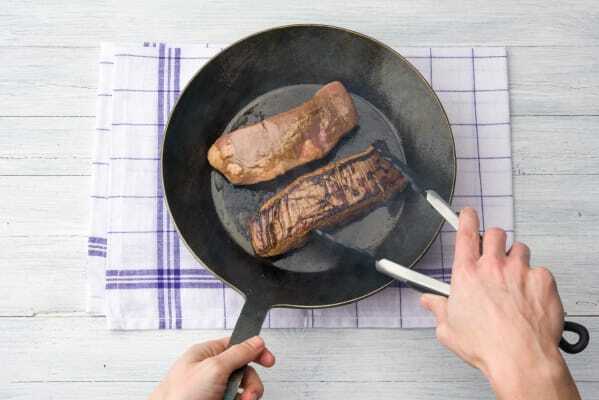 Add 1 tbsp of oil to a frying pan on a medium heat and when the pan is hot, add your steaks (leave the excess marinade in the bowl, you need to use this later!). Cook the steaks for 3-4 mins on each side and then remove to a board to rest for 3 mins. Tip: We like our steak medium but if you want it more well done, simply cook it for 2 more mins on each side. Add the marinade you left behind to the pan, along with your redcurrant jelly and 75ml of water. Tip: Use a spoon to break up the jelly so it melts into the sauce. When the sauce has bubbled for 2-3 mins and it is lovely and smooth, take it off the heat. 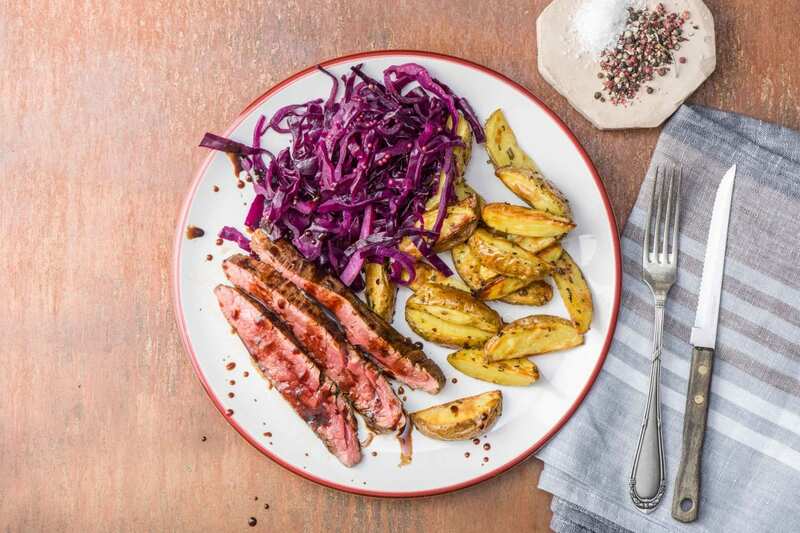 Cut your steak into 2cm slices and serve it with a drizzle of sauce, your potato wedges and a good spoonful of red cabbage. Voila!